An interesting read on the relationship between eco systems lawns and water. I see this play out on every project I do to various degrees. 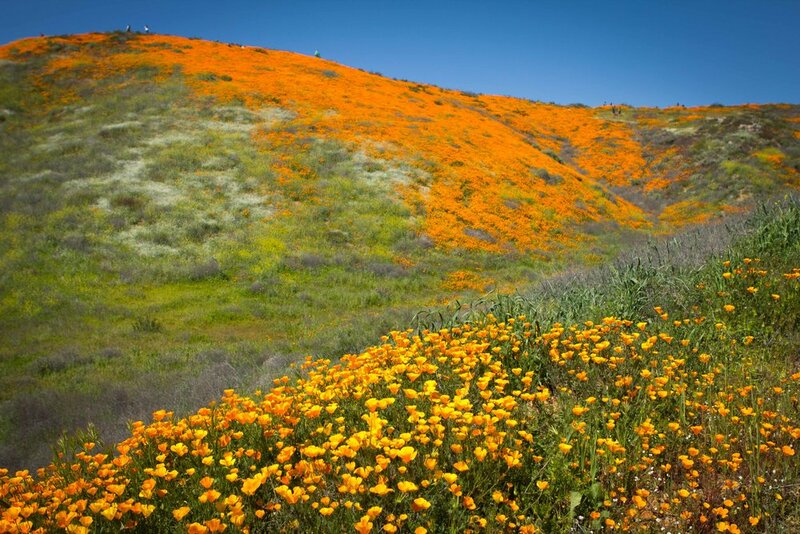 An amazing mass of wild flowers, primarily CA Poppies, covering the hills providing stunning visuals. Click image to scroll through the set. California has been blessed with another Super Bloom following the one in 2017. Plenty of rain with cool weather has extended the bloom period this year and is probably peaking everywhere about now so if you have some time this weekend pick a place and make a day of it if you can. It is a really wonderful event to be seen in person. Here is a link to a Conde Nast Traveler article with a quick overview. Los Angeles, CA, January 24, 2019 – Bosler Earth Design of Los Angeles has won “Best Of Customer Service on Houzz®, the leading platform for home renovation and design. Bosler Earth Design was chosen by the more than 40 million monthly unique users that comprise the Houzz community from among more than 2.1 million active home building, remodeling and design industry professionals. The Best Of Houzz badge is awarded annually, in three categories: Design, Customer Service and Photography. Design awards honor professionals whose work was the most popular among the Houzz community. Customer Service honors are based on several factors, including a pro's overall rating on Houzz and client reviews submitted in 2018. A “Best Of Houzz 2019” badge will appear on winners’ profiles as a sign of their commitment to excellence. Catherine Bosler, principle of Bosler Earth Design thanks Houzz for the continued recognition of the work we create for our clients and the wonderful creative community they have cultivated. Follow Bosler Earth Design on Houzz. Since graduating from UCLA in 2009, Catherine assisted in teaching Autocad in the UCLA Landscape Architecture program and freelanced with landscape designers/architects before founding Bosler Earth Design in 2014. Her first projects were from connections in the film world. From those first projects her reputation spread quickly by word of mouth and her business expanded. Catherine’s specialty in drought tolerant landscapes proved to be timely as California moved into a prolonged drought. Her style and creativity now go far beyond word of mouth and her work has been featured a number of times by Houzz editorial writers. The LADWP lawn removal rebate program is back at $2.00 a sq ft up to 1500 sq ft. This is still a nice bit of money to get started on a beautiful drought tolerant landscape because the drought is now part of life in SOCAL. Here is an interesting read on water capture and property taxes. If we continue to trend into a drought expect more incentives and higher costs for water. I recently read a wonderful article by Susan Tweit who wrote a piece for Houzz on food for pollinators in your garden. As a strong proponent on using plants to attract butterflies, bees, and birds this well written article more than caught my eye. Thank you Ms. Susan Tweit. The mud and debris has only been about half way cleaned up in Montecito from the recent mud slides of a month ago following the torrential rains that followed our fires. It seemed we were in for more rains and possibly more mud slides but everything has changed. We are officially back into a drought. The snow pack in the mountains are thin and we are back onto our over riding trend of less water resources. This article caught my eye because I have seen this exact situation in Los Angeles several times. Big, beautiful, older olive trees slowly deteriorating in a landscape because of a traditional water thirsty turf as the tree's base platform. The property owner usually suspects insects as the cause. There is not a colleague or gardener that I know of that did not see this coming unfortunately. What could be good news about the drought? The California State Water Board and it's water districts have created a variety of incentives for water conservation that will save money now and in the future for homeowners and businesses alike. Beyond even the cost of precious water resources there is money to be saved on the maintenance of our landscapes as well. So the good news is that an economic opportunity has presented itself out of our water crisis that will also help to mitigate the problem. A win win opportunity. Take good measurements and send them your planting plan. They will take you more seriously with rebate square footage approved numbers. Take at least 5 good pictures showing green grass. If your grass is brown or dormant they will not be able to see the difference between grass and soil and your final rebate numbers may be disappointing. If they turn you down there are no re-applications. There are specific examples of how the images should be shot on the web site link below. No close up images of grass but more expansive shots of the property with visual markers such as trees and structures are needed in the imagery. Manage your application time well. After the approval of your application, the property owner has 120 days to complete the new landscape installation. Do not miss the deadline as you will be rejected without the possibility of extension, re-application or reimbursement for your expenses. If your water provider is the Department of Water and Power (DWP), the link below are the specific rebate programs. DWP does not list all rebates on their web site such as for Weather-Based Irrigation Controllers or Soil Moisture Sensor Systems so inquire about them. If your water provider is the California American Water, the link below are the specific rebate programs. Following is a link for all state approved water conservation products even if your water company does not list these items on their web site.